Introit "Gaudete in Domino semper"
Motet "Canite tuba in Sion - Rorate, caeli, desuper"
Motet "Hodie nobis caelorum Rex - Gloria in excelsis Deo"
Motet "Hodie Christus natus est"
Motet "Quem vidistis, pastores - Dicite, quidnam vidistis"
Motet "Dies sanctificatus illuxit nobis"
Motet "Magi veniunt ab oriente - Magi, videntes stellam"
Offertory "Reges Tharsis et insulae"
A Christmas album for connoisseurs . . . [the Sistine Chapel Choir] here continues its excellent work . . . [the motet "Beata viscera Mariae Virginis" by Pérotin] is three minutes and 48 seconds of pure and sustained bliss. Bartoli captures the purity, awe and mystery of the Virgin birth . . . I genuinely cannot imagine a more exquisite sound. To hear this motet alone is worth the price of the recording . . . [throughout, Palombello's] pace or tactus feels right and the proportional relationships of metre are also convincing . . . It was a delight to hear boy trebles delicately ornamenting Victoria's "O Magnum Mysterium" . . . this is a most enjoyable recording and it is recommended. To hear music especially written for the Sistine Chapel, much of it by former members of the Sistine Chapel choir, sung by the present-day Sistine Chapel Choir and recorded in the Sistine Chapel is reason enough to celebrate the release of this disc. That every work on the disc is a true gem, a miniature masterpiece [and that some of it has not been heard before outside the Sistine Chapel is an even more compelling reason to seek this disc out] . . . The performances are well prepared and effectively and confidently delivered . . . a disc which exudes calm and beauty . . . Bartoli's contribution is to Peronitus's "Beata viscera Mariae Virginis". It may last less than four minutes of music, but it is four minutes of absolute sublimity. Bartoli beautifully encapsulates the essence of a text which conveys the joy, wonder and mystery of the Virgin birth . . . A highly atmospheric celebration of music from the Vatican archives . . .
For the first time, on this recording, the Sistine Chapel Choir and director Monsignor Massimo Palombella have invited a female singer to record with them – global superstar Cecilia Bartoli. 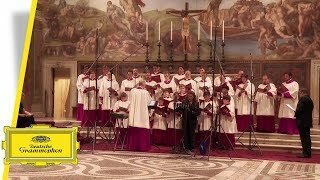 After Cantate Domino (2015) and Palestrina (2016) this year’s Veni Domine - Advent & Christmas at the Sistine Chapel is the third installment of the unique collaboration between Deutsche Grammophon and the Vatican’s own Sistine Chapel Choir. 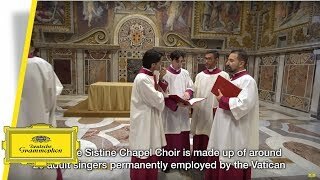 Learn more about the members and the history of the Vatican's own Sistine Chapel Choir.